When I was first becoming aware of the world, circa 1959, I loved Elvis movies and knew the songs by heart. My parents were fans so we watched whenever an Elvis film was on one of our three channels. As an 8 year old I discovered the three “B’s” – Beatles, Byrds and Beach Boys and parallel to that, Elvis became stale and the reruns tiring. I did not think much about Elvis from 1965 until his death in 1977. Sure there were some great songs, “Kentucky Rain,” “Suspicious Minds,” “In the Ghetto,” Guitar Man,” “Burning Love,” but when you compare what he was doing in the movies and Las Vegas with Otis Redding, Al Green, The Band, CCR, CSNY etc. Elvis was not in my radar. I have to say, I was emotionally shaken because Elvis was such a fixture in everyone’s lives, one you figure would always be around even if you ignored him. That same night, I had a double date with a friend and two sisters to go to a Leo Sayer concert in Huntsville, AL. Sayer was hot at the time and the sold out show was very good but I remember being put off by the fact that he did not make a mention of Elvis’ passing. Even if the guy did not want to throw in an Elvis cover, the least he could do would be to acknowledge the biggest cultural icon of the past 22 years. Right? Well, Elvis is still popular and how many people still remember Leo Sayer? I wrote earlier that Elvis changed my life two decades on but he changed it in a positive way, just a month or so after his death. A friend and I opened a record store of our own in nearby Ft. Payne, AL, (home of the band, Alabama). Our primary distributor, based in Nashville, wanted to make sure we established a good outlet for the area so they gave us the first batch of Elvis records available in over six weeks. Needless to say, we ordered hundreds and put out ads all over North Alabama that we had the booty. People drove from as far away as Birmingham to buy the audio drugs we were selling. There is always a demand for music when a prominent artist dies but I have never, before or since, experienced anything like this. That started our new business on a great track. Too bad it did not last. Now, back to two decades later – through coincidence or fate, I met Elvis’ first guitarist, Scotty Moore, and drummer D. J. Fontana along with a slew of other Sun Records musicians and artists, including Mr. Sam Phillips, in 1992. That led to managing their comebacks by pairing them up with slightly younger artists who were influenced by those unbelievable tracks from the Sun sessions and early RCA recordings. We recorded with Keith Richards, The Band, Jeff Beck and many others for a record of all new material called All the King’s Men. In 1997, we were nominated for a Grammy, toured Europe several times and participated in a major PBS documentary about Sun Records in it’s hey-day– Good Rockin’ Tonight: The Legacy of Sun Records. This incredible chapter even led to a chance encounter with the great George Harrison (Part 1, Part 2). In the 2000’s, I was directed and co-produced three films (with much help from producer Susan Rod Graham), all Elvis-related. Rex Fowler, from the excellent duo Aztec Two-Step, had an idea for a film about all the gifts Elvis gave away and, through a mutual friend, we were introduced. He had a great title: “200 Cadillacs,” (the rumored number of cars he gave to friends, family and strangers). I immediately thought of the Frank Zappa film from the early '70s, “200 Motels” and thought our film should be semi-serious, semi-parody with new music and animation – and updated version of Zappa with Elvis thrown in. Ironically, Zappa’s film was the first shot entirely on videotape. Ours was among the shot on digital tape. After losing financial backing while in Memphis filming Elvis Week, Susan Graham came in and became an equal producing partner with Rex and me. With two die-hard Elvis fans on board the film became a real tribute to the man and his love of giving. While in the middle of production, I realized they were right and saw first hand that Elvis was not the pill-popping slug I figured him to be. At least not entirely. I was still put off by the way he treated Scotty, D. J. and the late Bill Black, but I could see that he did a lot of nice things for a lot of people. I co-authored a book, The Blue Moon Boys: The Story of Elvis' First Band, published in hardcover by Chicago Review Press in 2006, which allowed me to use the “published author” title in my resume. I have two films nearing completion (Scotty Moore & Friends Live In London 1999 and The Return of the Blue Moon Boys) so to say that I owe Elvis big-time – and I am far from the only one – is an understatement. 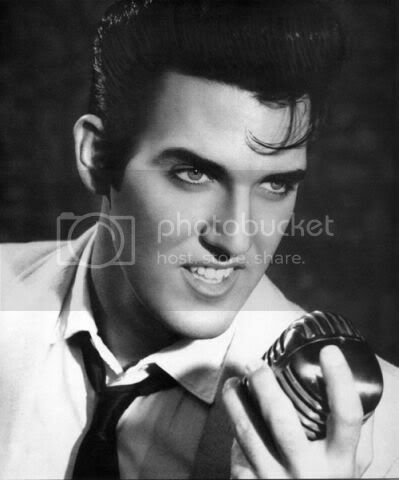 On the 35th anniversary of his passing, I will light a candle and thank Elvis for giving me an interesting life.